Farrar Straus Giroux, 9780374266752, 392pp. Most of us know a bit about what passes for good manners holding doors open, sending thank-you notes, no elbows on the table and we certainly know bad manners when we see them. But where has this patchwork of beliefs and behaviors come from? How did manners develop? How do they change? And why do they matter so much? In examining English manners, Henry Hitchings delves into the English character and investigates what it means to be English. "Sorry " presents an amusing, illuminating, and quirky audit of British manners. From basic table manners to appropriate sexual conduct, via hospitality, chivalry, faux pas, and online etiquette, Hitchings traces the history of England's customs and courtesies. Putting some of the most astute observers of humanity including Jane Austen and Samuel Pepys under the microscope, he uses their lives and writings to pry open the often downright peculiar secrets of the English character. 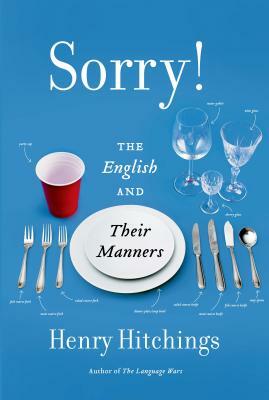 Hitchings's blend of history, anthropology, and personal journey helps us understand the bizarre and contested cultural baggage that goes along with our understanding of what it means to have good manners. Henry Hitchings was born in 1974. He is the author of The Language Wars, The Secret Life of Words, Who's Afraid of Jane Austen?, and Defining the World. He has contributed to many newspapers and magazines and is the theater critic for the London Evening Standard. He lives in London.